Are Dental Implants an Option if My Gums Are Receding? If you have lost teeth due to trauma, decay, or gum disease, there are a few options out there to help you to restore your smile. 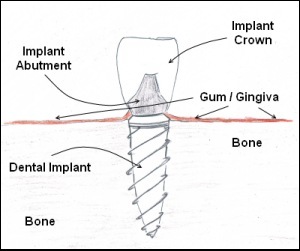 One of the best available right now is dental implants, which is a permanent solution to tooth loss in which a metal rod is implanted directly into your jawbone and topped with a crown that will match the rest of your teeth. Unlike dentures, you won't have to worry about these prosthetics slipping out of place or affecting the way that you eat or speak. While dental implants are a great option for most people, it is important that any conditions that could potentially impact the dental implants negatively are treated before the implant is put into place. When your gums have receded, there may have been a considerable loss of support to the gum tissue and jaw bone, and this is a critical factor in whether dental implants will be successful. If you have experienced gum recession and are interested in implants, hope is available. Many periodontists recommend a grafting procedure in which supplemental gum tissue can be added around the area of the dental implant. Typically, this procedure will be performed several months ahead of time so that the tissue can grow and that your mouth can heal properly before the dental implants are put into place. Once the grafting has taken place and your implants are put into their new position, it is important that you work to protect your gums and the rest of your mouth. Allowing gum disease to return and cause continued gum recession will likely cause the implant to fail, so you'll need to work with your dentist to find out exactly why your gums receded in the first place to develop an effective strategy. By making your oral health a priority, you can enjoy a beautiful new smile with dental implants even if you have suffered from gum recession.